Street of Thieves (translated by Charlotte Mandell, e-copy courtesy of the publisher) begins in Tangier, where a Moroccan youth by the name of Lakhdar is attempting to balance his religious upbringing with impure thoughts for his cousin. When caught in flagrante, he is forced to leave his home and spends the best part of a year roaming the country, surviving through his native cunning and the kindness of strangers. 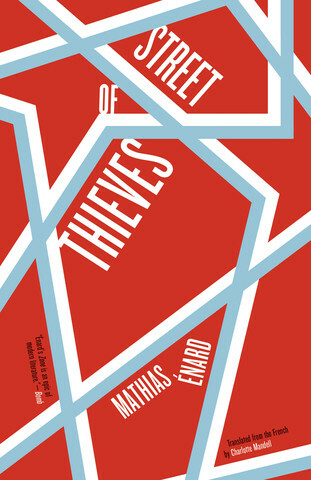 Street of Thieves is another excellent novel, once again superbly translated by Mandell. While the style isn’t as unique as that employed in Zone, the writing is still powerful, with glimpses of the rolling sentences typical of the earlier book. This is the story of a young man born on the wrong side of the Mediterranean and his struggle to make it over a stretch of water that looks much narrower from Europe than it does from Africa, a portrait of Énard’s zone from the other side of the divide. The two friends each have their own way of dealing with their frustration, one with girls and French noir novels, the other with religion. It remains to be seen which will bring greater happiness. The second part of the book describes Lakhdar’s journey to Europe, a short trip on the map, but one of light years for an unwanted incomer. Though he’ll get there eventually, life on the other continent isn’t all he dreamed it would be. When he finally arrives at his ‘destination’, he’ll discover that the Street of Thieves, his new home, can be every bit as much of a prison as Tangier was. While much of the focus is on one young man’s experiences, the background action looks at the wider context, with much of the story happening against the backdrop of the Arab spring. Many of the more explosive events happen elsewhere in North Africa, but Morocco is not immune to the feelings of unrest. Lakhdar soon suspects that the true purpose of the group he’s working for might not be limited to using prayer and literature to spread their cause, leading him to worry about what Bassam is getting up to. In this tense atmosphere, you never know what might happen next, or who’s watching you from the shadows (it’s tempting to imagine Francis Mirkovic, the hero of Zone, somewhere in the corner of a café, taking notes for his bosses…). It’s an interesting juxtaposition, a conflict probably repeated daily across the Islamic world, where young men juggle with the demands of faith and the temptations of the secular world. Lakhdar comes to focus on the medium, rather than the message, and it is here that Énard’s background comes to the fore, with his love of Arabic evident in every description of the language. Street of Thieves often flows like a standard narrative, but occasional comments from the narrator remind us that the book is being told from a future perspective, with our young friend looking back at the past. Ever so gradually, the reader senses that it’s all going to end badly – we’re just not sure how, exactly. Énard plays with the reader, leaving tantalising hints of what’s to come, but despite these scattered clues, the ending still comes as a shock (well, it did to me, at least…). Your review has me intrigued. I suspect that this will be somewhat more to my liking than Zone (which to be fair I did not dislike and have grown to appreciate more as time passes). The setting and the conflicts sound very timely. Énard certainly has a way of keeping a finger on the pulse of the tensions that are at the heart of so much that we are facing as a global community these days. Relieved that you liked this as review in the TLS was complimentary about Zone but scathing about Street of Thieves. I worried Enard might be a one book wonder. Grant – That surprises me – there’s nothing wrong with this, even if it’s very different in style at times. This sounds quite appealing to me too, thankfully books are such subjective things we can get an idea whether we’d like to consider it from an excellent review! Claire – Well, I do my best 😉 It’s a simple tale on the surface, but there’s plenty hidden a little deeper for those wanting to dig down (e.g. the Arab Spring, attitudes towards immigration in Europe). Hi Tony, Roughghosts and anyone else in the UK interested in this book… Just a quick line to confirm that Fitzcarraldo Editions will indeed be publishing Street of Thieves in the UK this coming August. So pleased you liked it. As you say, the style is very different from Zone, but the quality of the writing is still there. I’m really looking forward to this one. It sounds like there’s some interesting connections to Zone, but more than enough different that Enard’s not just repeating himself which would be terribly dull. Fitzcarraldo really do seem to be putting out some interesting stuff.